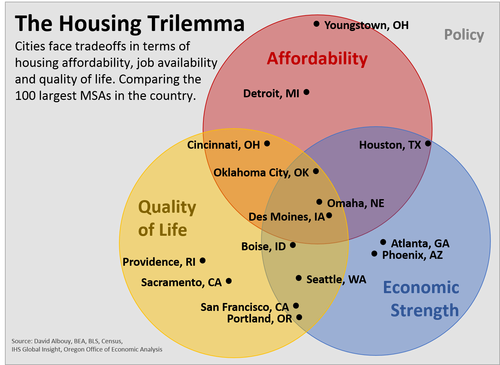 I came across some interesting analysis from Josh Lehner at the Oregon Office of Economic Analysis about the “Housing Trilemma”. Every city wants to have a strong local economy, high quality of life and housing affordability for its residents. Unfortunately these three dimensions represent the Housing Trilemma. A city can achieve success on two but not all three at the same time. Underlying all of these tradeoffs are local policies as well. *image from Oregon Office of Economic Analysis. The Excel spreadsheet contained all the data, along with a list of sources, and the percentile rank of each metro across each variable. The interactive spreadsheet was well done and easy to use, but I thought this might be a good case for a remix. Using animation through tweenr we could compare all the metros at once. Ultimately, I ended up with the chart below. Let’s build it. I’m going to be using R and the animation and tweenr packages along with ggplot2. See my earlier post about tweenr for an introduction, and more examples here. The R code for the viz above is below. I used some Excel tricks to manipulate the original dataset into a text file. We start with a simple text file you can download called trilemma.txt.